If you have ever wondered what pitched battle would be like, I highly recommend you watch a game of rugby. In the heat of the match, when both teams are engaged in a scrum, ruck, or maul, it is easy to believe that you have gone back in time to witness one of history’s greatest events–man to man combat. If you don’t believe me, I invite you to watch the Hakka. With nothing between opponents but brains and brawn, rugby outstrips any other team sport for it’s reliance on teamwork. While the history of rugby is steeped in lore– in 1823, a young boy by the name of William Webb Ellis, a pupil of the Rugby School in England, defied common football rules of the day, and picked up the ball and ran with it– what is known is that the official rules of rugby were established at the Rugby School in 1845. Though it’s roots are in England, rugby is a sport that spans the globe. Great teams have emerged in countries such as South Africa, Australia, France, Argentina, and New Zealand. Like soccer, it is a sport that most of the world knows and loves, but Americans have a hard time figuring out. It is a great time to be a rugby player in North America. When I was a teenager growing up in Canada, rugby was just becoming popular in my area of Southern Alberta. Most of the boys I hung out with were on one team or another, and watching each game became a fascination for me. I was amazed by a game that was played so selflessly. Many a Saturday was spent, in my house, watching football and basketball with my dad. We would watch together our favorite college teams winning, but mostly losing, and holler at the television set together, before my dad would finally give up and turn the television off. If it was a particularly tense game, I wouldn’t even bother entering the room. Those sports stood out to me as games that, while played by a team, were carried by relatively few players. And it was those players that got all the attention. As an athlete myself-basketball and volleyball mostly- I recognized this too. I showed up to every practice, ran all the wind sprints, did all the drills, shot all the shots, but spent most of the time on the bench. Okay, maybe my shot was a little off, but man, could I defend. And it wasn’t just once or twice that I received a full cadre of fouls enough to boot me out of the game. I really enjoyed defending the ball. But I didn’t enjoy feeling like I wasn’t a useful member of the team because I wasn’t a star player. So, I admit it, I quit. I quit because I couldn’t understand how my effort wasn’t valued as highly as the rest of the team. I wasn’t a bad player, I just wasn’t the best. And, maybe I quit, too, because my coach made me choose between snowboarding and basketball. And that’s what drew me to rugby. Everyone on the pitch has a purpose. There is not one player on a rugby team that rides the bench. You can’t win a rugby game if you are selfish. You just can’t. Yes, there are stand-out players on every team. But even those stand-out players will tell you that they play as a team, and they carry each other. If you look at the diagram above, you can see why each player is important. The players huddled together in the center form the scrum. Players 1-6 are literally holding each other up as they engage with the exact opposite from the other team in a battle for the ball. 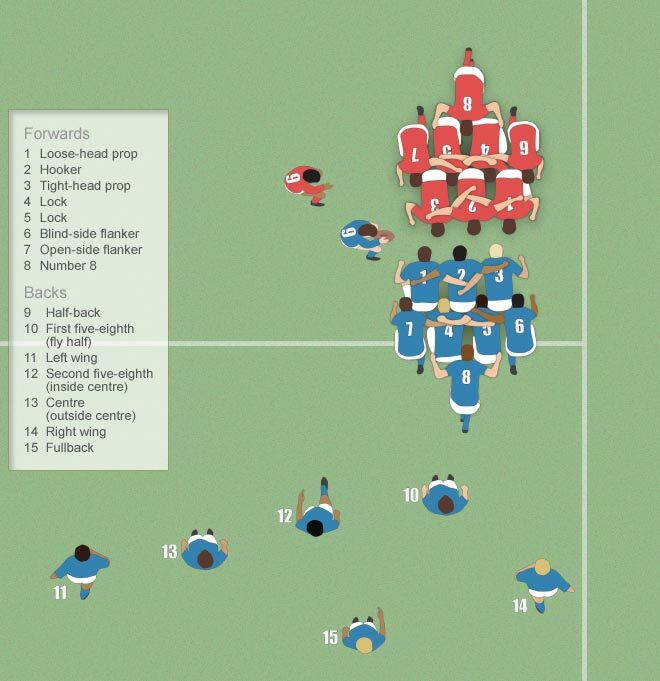 The 8-man acts as the driving force that gives power to the scrum, and it is the job of the scrum-half, or half-back (number 9), to place the ball in the scrum, call the orders, and retrieve the ball from the melee. Acting as the lynch-pin between the fronts and the backs, the scrum half delivers the ball to the backs, and from there, it is the job of the backs to pass the ball down the line as fast as they can to the wing man. From there, it is an all out dead-sprint to the try-zone, as the runner jukes defenders, and gets jostled in return. Unlike football, when a player hits the deck, the play does not stop. In fact, going to ground is an essential strategy of rugby. When a player is tackled, instead of turning over the ball, the player presents the ball to his team mates while lying on the ground. It is then the job of the forwards to create a ruck, or a man-made wall, that protects the line of scrimmage from the other team. It is the job of the scrum half, then, to come and get the ball out of the ruck and again pass it backwards to the back line. In a ruck, the opposing team cannot touch the ball unless their ruck is stronger and can push their ruck forward and over the ball. Once they have achieved that, they have moved the ball behind their line of scrimmage and can now touch the ball, because in rugby, the ball can only be played by moving backward. Which, yes, seems kind of backwards. In all of the rucking and mauling and scrumming, a player has to know that his teammates have his back. That they will be there when he needs them the most. Because the ball cannot be passed forward, the person with the ball can only trust that his teammates are right there with him, a step behind, ready for a pass or a ruck at any moment, even when he can not see them. That is what rugby teaches a player–that his teammates are there for support. Rugby teaches kids to trust each other, and to rely on one another. Too often today, kids find themselves feeling left out and with no one to turn to for support. In rugby, no one is left out, and everyone is there to support. Rugby often gets a bad rap as a rough sport. I’m not going to lie–it is. But players get hurt in any sport. The aim of tackling in rugby is not to end the state play, but to reorganize play. In rugby, players are taught to aim for the hips and thighs, wrap and squeeze, and bring the opponent down. Tackling this way keeps the upper body safe from collision, and if done correctly, does not injure an opponent. You don’t need to be a giant to get the job done, you just need to get low and don’t let go. Perhaps you are wondering why I am rhapsodizing about rugby if I have never played the game. You know, there is a part of me that wishes I had taken the chance. Like I said before, I love to defend the ball, and I’ve got a long list of foul-out’s to prove it. Rugby has been a part of my life for over 16 years. My husband and his brothers played while we were in college. After college, my husband continued to play and coach in Washington D.C., Chicago, and Texas. And now, our three boys have been playing for the last four years. At the beginning of every rugby season, I can’t wait to watch my sons take the field and do what men were meant to do–use their brain and their muscles to defend. And at the end of the season, I mourn that those opportunities are over. As a mother of boys, I think it is so integral for a growing male to have every opportunity to use his body in the way it was intended–for strength, grit, and endurance. Boys today do not have this opportunity. They are living in a world that requires them to mask their masculinity in favor of femininity. And that, I do believe, is not healthy for them. Yes, rugby is a sport that is welcome to all genders. And as a female athlete, I am all for equality and I believe that women can be just as successful as men on the sports field. But, again, as a mother of boys, I am a valiant guardian of their right to be just what they were intended to be–men. That’s what I love about rugby. Rugby players don’t give up. Even if their team is losing. Even if the other team is losing. You run up the score, or the score is run up on you. Not everyone gets a medal. And, sometimes you get knocked flat on your back. But you get up again. You get up again because you and every one else on that team knows that the game does not wait for you. It goes on whether you are there or not. But without you, your team is lacking an essential support. At the end of the game, a rugby player comes off the field covered in mud, sweat, blood, and tears. It’s easy to see exhaustion on a player’s face, and in their form. I love to see that. I love to know that for forty minutes, my kid was out there giving every darn thing he had for everyone else. That the amazing body God granted him was running on full cylinders. That he was with his team, and they were with him. And that they fought together. At the beginning of this article, I listed the many countries that popularized rugby. The United States wasn’t on that list. Right now, little ruggers are out there, all over the United States. Learning how to play as a team. If my three boys are anything to show for it, rugby in America will go far. And it will have a great wealth of world cultures, and strong men and women ready to fight together for something bigger then themselves. For their team. In a world that is so divided by personal devices and social sub-cultures, it is time to celebrate something with roots. Something that a young boy once had courage to pick up the ball and run with. Shout out to Woodlands HS Rugby! Let’s bring home a state championship this weekend! !